So the people that can “protect” your data are also the ones… selling it? Updated 10/11/2011: Although TrueRep does have paid features, we’ve learned that it’s free to suppress your data from appearing on Intelius and three of its partner sites. 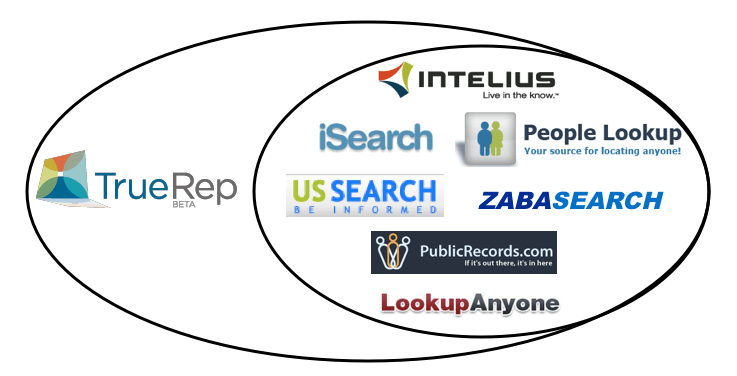 Suppression is limited to your two most recent addresses and one phone number, and it doesn’t extend to Intelius’s other partner and affiliate sites, such as Zabasearch, PeopleLookUp, and USSearch. Intelius, which collects and sells your data, recently launched a new company called TrueRep that you pay to, among other online reputation services, view your own data. Take a second to wrap your head around that. 1. Intelius collects your personal information from various sources, including social networking sites, public records, and powerhouse data collectors like Acxiom. 3. If you pay for a subscription to TrueRep, Intelius will then let you manage the way your information appears on its network of sites. They worsen your privacy problem; you go to them to fix it. Does that make sense? And here’s the icing on the cake: you’re required to log in with your Facebook account. 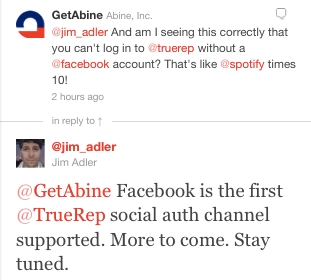 Our twitter conversation about this with Intelius’s Chief Privacy Officer, Jim Adler. TrueRep protects you from others who may want to claim your identity. Therefore, it is required that you verify your identity through signing in to your Facebook account. First of all, it’s a total non-sequitur to say that having a Facebook account is at all related to protecting your identity. If anything, having a Facebook account makes you more vulnerable to identity theft. The FBI even has a name for identity thefts carried out through social networks: “identity theft social engineering.” It’s more effective than other forms of identity theft because it often comes through our Facebook friends, whom we’re more likely to trust. 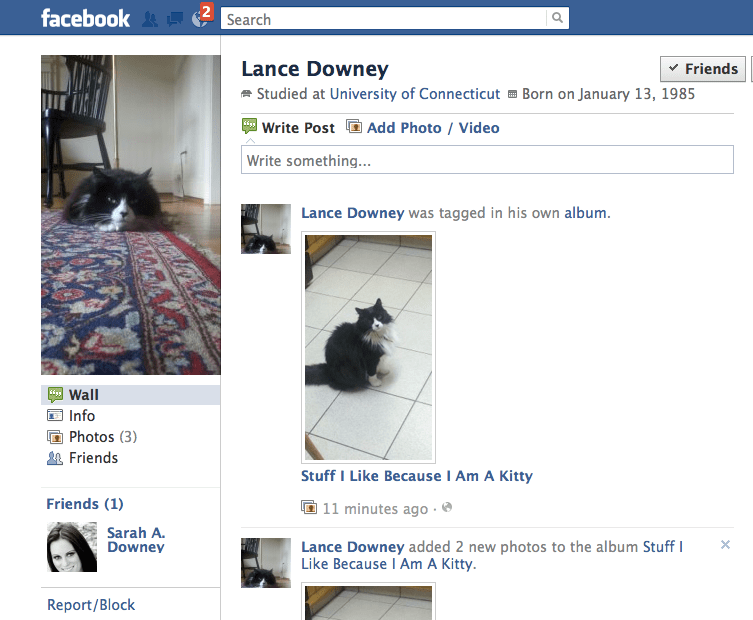 If my cat can get a Facebook account, so can anyone. Or anything. He’s a very sociable cat. Feel free to send him friend requests. And right away, my cat was a TrueRep member. So the whole part about requiring you to sign in with a Facebook account as some protective measure against “others who may want to claim your identity” is, pardon our French, total crap. We realize that Intelius wants to use some form of identity verification, but Facebook connect–at least in its current form–isn’t cutting it. Lance is very concerned with his online reputation. Intelius, one of the biggest databases of background check information, is no stranger to privacy-related complaints: their network of sites has come under fire for deceptive marketing, unauthorized charges to customers’ credit cards, having inaccurate data (although this might be a good thing for those of us worried about our privacy), not honoring opt-out requests, and having a complicated opt-out process. If you want to opt yourself out of their databases, and those of many other similar sites, we wrote a page explaining how to do it yourself for free. What do you think? Would you trust TrueRep with your personal information? How do you feel about sites that require you to log in with Facebook connect? What a cute cat! What does she eat? It is a great idea to open a facebook account to cats! I’m gonna open one to my cat too. 🙂 Thank you. He eats pretty much everything, including cooked broccoli. Seriously. Actually, my husband just told me that I shouldn’t open a facebook account to our cat because it goes against facebook terms of service. Not to mention someone with bad intentions can steal my cat’s privacy. I’m going to have to think about it now. Can abine help me with this? It actually does violate Facebook’s Terms of Service to create an account for anyone other than yourself, and even then, you’re supposed to keep it to your “real,” legal name. However, it’s rarely, if ever, enforced. Thus, the point that TrueRep is trying to make–that having a Facebook account somehow serves as identity verification–is BS. Sounds like the phone company to me. Sell the consumer Caller ID, then sell Caller ID Block to telemarketers, then sell Privacy Manager to consumers…. Good call. Very similar business model. Just because facebook doesn’t (at this point in time) enforce those terms, that doesn’t make it right that you _can_ sign your cat up. Most things aren’t a question of whether you can, but rather whether you should. You agreed to the terms with no intention of upholding your end of the agreement, so you should be prepared for the full repercussions of that decision should they be enforced. Understood. I won’t create a facebook account to my cat. Thanks for clarifying that it happens all the time, and that it’s not that big deal. I asked my husband, and he insisted that I shouldn’t do it for various legal reasons. I don’t want anybody to use this as an argument that we are breaking any law or may end up with a criminal record. I wanna keep his reputation clean. If Intelius now expects us to pay for a service that maintains our information, what makes you think they’ll be motivated to opt us out for free, no strings attached? 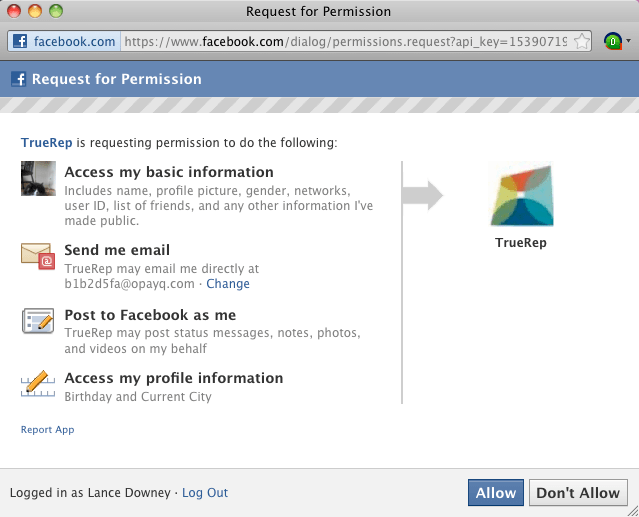 The opt-out portion of TrueRep actually is free. The reputational part isn’t. It’s free, yes… but at what cost? No cost, honestly. We want to get users. Down the line we’ll probably offer upgradeable features to those who choose to pay, but the functionality of the free product will be the same. It’s the freemium model. The company TrueRep is under is called Intelius. If you sign up with Intelius, you pay for a 14.95 service, looking up people online, but what they dont tell you is that you are being signed up with TWO different companies, one charging you 9.95 a month, without your consent and the other is 19.95 a month, also without your consent. Trueprep is the one charging you 9.95 a month and like any other scam company, they give you not way to cancel out of your membership. No online service, even though there is a link that says you can cancel your membership online, it just takes you to their home page with no option to cancel. RIP OFF COMPANY “INTELIUS” “IDENTITY PROTECTION” AND especially “TRUEREP”. no help or support….these places are a scam. Thanks for the heads up, and I’m sorry to hear you’ve had trouble with them. I’d suggest that you complain to the Better Business Bureau. People just don’t care how they are being manipulated anymore I guess..
Facebook steals your personal information sells it to intellus and then YOU have to buy a service truerep to have it removed. Someone needs to do something about this blatant invasion of privacy and extortion.